If you’re relatively new to paddlesport or have only dabbled in it in the past few years it may seem like a huge jump from paddling in a swimming pool to leading a day’s sea kayaking trip. In addition to the Club’s regular River Thames sessions and the separately run Open Pool Session there are regular trips, activities, coaching and leading opportunities which are appropriate for various skill levels. As you progress you will gain your independence on the water, learn the necessary skills to paddle efficiently and effectively, and ultimately lead groups in appropriate conditions should you wish to do so. The movement skills learnt by regularly attending weekly sessions and moving progressively through to intermediate trips should transfer to any paddlesport discipline, however CKC’s core focus is sea kayaking and touring. There are no hard and fast rules as everyone progresses at different rates. Neither is there a fixed progression where the next level is reached when a particular trip is completed. The jump in skill level is more marked between the higher levels and most paddlers will need to do several trips at a certain level to demonstrate that they are confident and competent before moving up. Your level of paddle fitness is another important factor to consider. At the end of the day, the best way to learn is to get involved and have fun. 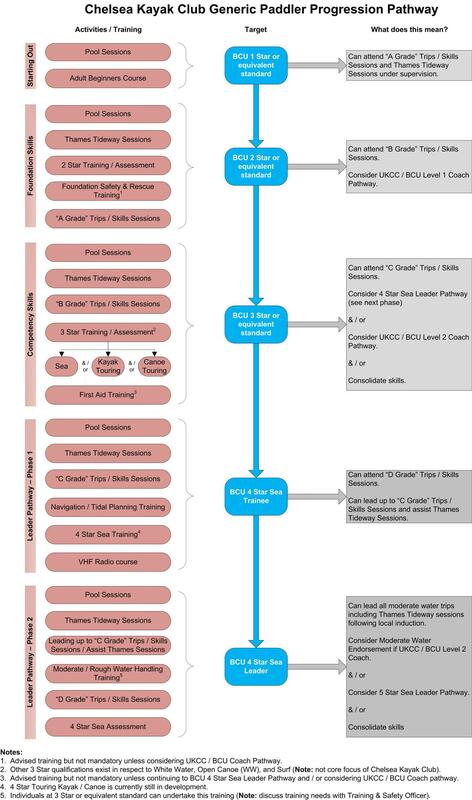 The Club has developed a Generic Paddler Progression Pathway which is shown below. It should be read in conjunction with the Club’s Trip and Session Guidelines and the Resources section of the website. If you have developed the necessary skills there will be opportunities to be assessed on the BCU Star Awards as well as in other qualifications (e.g. First Aid, VHF Radio, Coastal and Tidal Planning, etc). However, it is not necessarily all about “bits of paper” and as to whether you should do the assessment is completely up to you, the Club will certainly not mandate this. It might be that to undertake the training may be more than sufficient to meet your personal goals without ever needing to be formally assessed. Having said this, you may find that not having the “bit of paper” could limit what trips you can participate in particularly those overseas where rental companies may may insist on seeing certificates (e.g. BCU 3 Star Sea) as a prerequisite to loaning out boats and equipment. Furthermore, if you think you might want to move into either the coaching and / or leading pathway then a number of the qualifications are mandatory prerequisites. An overview and links to further information on qualifications can be found on the Resources section of the website. The pathway above is generic and it should only be used to help you to determine roughly where you are and where you might want to go. The Club is there to support you so talk to any of the existing coaches or leaders and the Training and Safety Officer and they will help you come up with a personal plan.